Great footballers don’t just appear from nowhere, as if by magic. The best players in the world—whether it’s Leo Messi, Gareth Bale, Neymar or Cristiano Ronaldo—learned the finer points of football at a professional soccer academy. A select number of those sporting schools, affiliated with both superclubs and lesser lights, have shown themselves to be above the rest in their ability to produce top-level talent. Here are the world’s 10 best soccer academies—and what sets them apart. In just the last few years, the Belgian club’s academy has produced some standout performers, including Vincent Kompany, Romelu Lukaku and Adnan Januzaj. According to team resources, the program’s goal is to mold players capable of playing at a Champions League level by age 18-21 through rigorous technical, tactical, and mental training from as early an age as possible. Until age 14, teams play a 3-4-3, transitioning to a possession-based 4-3-3 in older groups. The academy, also known as Hitrec-Kacijan, has risen to prominence in concert with the resurgence of the Croatian national team. Luka Modric, Niko Kranjcar, and Dejan Lovren all came through the ranks to forge successful careers in the Barclays Premier League. The program operates on a budget of €1m a year, which, when compared to their competitors, make the results particularly impressive. It emphasizes “situational conditions” and small-sided drills over formations and systems. 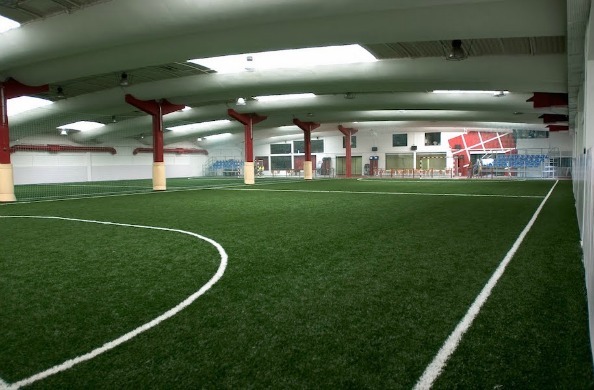 Brazilian club Sao Paulo’s 220,000 square meter compound, built on a hillside outside the city in 2005, features eight playing fields, two pools, and lodging and health services for over 100 players. Ten different national teams fought to use the beautiful facilities, where Lucas Moura and Oscar learned their trade, as a home base for the 2014 World Cup. Kaka also came through the Sao Paul youth ranks, albeit before the new facility’s completion. Additions made in 2013, including a medical center and sports science department, to the club’s Carrington training center brought its total cost to over £60 million. The academy has its own building within a complex that is regarded as the most secretive and secure in Europe. A youth program that once trained Sir Bobby Charlton is most famous for its “Class of ’92,” the group led by David Beckham, Ryan Giggs and Paul Scholes that went on to claim the Treble. The house that Pelé built has produced a few gems since, including Diego, Robinho and Neymar. Located inside the Estadio Urbano Caldeira, where the first team plays its matches, the youth complex features full living facilities for 270 trainees. The club prioritizes education and has built an adjacent study center to that effect, and also provides full health care coverage for youth teamers. Executive director of football Les Reed has overseen a revolution at the South Coast club, one firmly rooted in the academy system. A new 30 million pound facility, opened last year, will augment a setup that has already produced the likes of Gareth Bale, Theo Walcott and Adam Lallana. The program prides itself on its extensive scouting network, aided in no small part by the famed “black box” theater onsite, which is also used for training and match analysis. Created in 1902, the Bayern Junior Team once featured Franz Beckenbauer and Sepp Maier in the same defensive unit. Since it was remodeled in 1995 with the mission of helping “FCB to keep a global position in club football in the next millennium,” the academy has switched to a universal 4-3-3 system and overseen the development of Bayern stars and 2014 World Cup winners Philipp Lahm, Bastian Schweinsteiger and Thomas Muller. Sporting Clube de Portugal’s youth facility, a 250,000-square-meter complex just outside Lisbon, was once home to the likes of Nani and Cristiano Ronaldo. The complex features state-of-the-art training and recovery amenities to be sure, but the program, where Portuguese legend Luis Figo also got his start, has also received awards for its attention to trainees’ academic and ethical training. Barcelona’s La Masia is on even the most casual soccer fan’s radar these days, and with good reason. The program is united under a singular philosophy: the ‘Total Football’ derivative of tiki-taka, a pass and move possession game predicated on supreme technical skill. In 2010, the academy achieved the unprecedented feat of having trained all three Ballon d’Or finalists: Lionel Messi, Andres Iniesta, and Xavi. The Amsterdam giants have been champions of Europe four times, due in large part to a legendary academy setup. Both ‘Total Football’ and its greatest practitioner, Johan Cruyff, were molded in the Ajax academy. Many of the core tenets of that philosophy remain today, with all age groups playing a fast, interchanging 4-3-3 system with an emphasis on ‘TIPS’: Technique, Insight, Personality and Speed. If one parent is obese, there’s a 50 percent chance that their children will also be obese, according to the American Academy of Child and Adolescent Psychiatry. But when exercise is a regular part of the family’s activities, everyone wins. The holiday season is here! If you are looking for the best gifts for that soccer fanatic in your life, look no further... Click to read about the 10 gifts every soccer fanatic would love to get this year.